This is a TP course so bring your book. We have 5 flights booked and we are currently at 18 players so room for 2 more. Since the course will be busy, it being FT day in KL and many people are already on holiday for CNY, we will eat at the club. 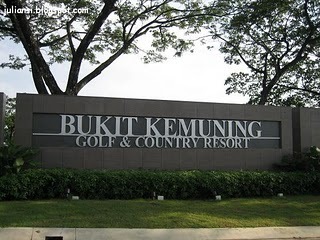 Next Tuesday, 1st February, we will play Bukit Kemuning. 4 flights have been booked for an eight O’clock tee off so BE THERE by 07:30 LATEST. Oh and yes, I know it’s a PH in KL. We will take M&M off course. Thanks go to Barry for making the booking in my absence. If you want to play respond to Mike Smith.